I'll confess up front that I'm a fan of WD's efforts to make NAS remote access easy enough that anyone can set it up. 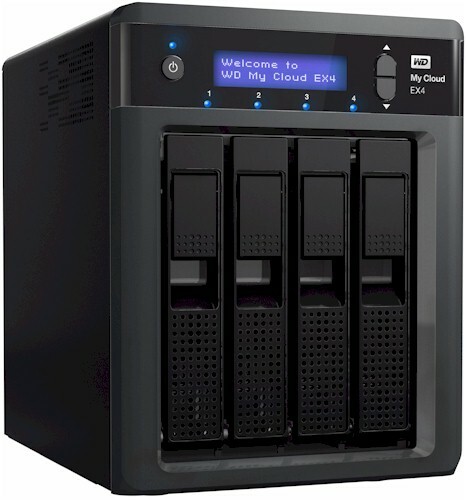 I use the precursor to WD's single-drive My Cloud—the My Book Live—as part of my personal storage system. If you read the review, keep in mind that the feature set with current firmware is more like the single-drive My Cloud than what's described in the review. WD apparently is a fan of its own work too; enough to expand the My Cloud line to include the four-bay My Cloud EX4 that is the focus of this review. The EX4 follows the design path taken by many other NAS makers by including features intended to make it attractive to both consumer and business buyers. But, as you'll see later, it's really too underpowered to make it suitable for only the most basic small-business use. The callout diagram below shows the EX4's key physical features. These include dual USB 3.0, Gigabit Ethernet and DC power input ports. It's nice that the EX4 has an LCD status screen, but it doesn't have a buzzer to sound audible alerts. The four drive bays accept raw 3.5" SATA drives from this fairly small compatibility list. The drives don't need trays; they're guided and held in place by a simple, but effective tool-and-tray-less design. WD provided the WDBWWD0080KBK 8 TB model for review. But the EX4 is also available in 12 TB, 16 TB and diskless configurations. The EX4 is designed around a Marvell 88F6282A1 Kirkwood SoC clocked at 2.0 GHz. There is also 512 MB of DDR3 RAM and 256 MB of Samsung flash. The extra SATA ports not provided by the Kirkwood SoC come from a Marvell 88SX7042 PCI-e 4-port SATA-II controller. Note that two of the four Hynix H5TQ1G83DFR RAM and the Samsung K9F2G08U0C flash devices are on the other side of the board. There is also no beeper / buzzer for audible warnings. The Kirkwood SoC has no heatsink or other thermal relief on it. All this and a few other components are summarized in the table below alongside the summary for the single-bay My Cloud. The 8 TB model we were provided for review had four WD Red 2 TB (WD20EFRX) drives loaded. The system drew 24 W with all drives spun up and 14 W when the non-programmable idle drive timeout kicked in. System noise was judged to be Medium Low with mostly drive noise audible in our quiet home office.